At arrival you will met our representative. He will assist and transfer you to the Hotel. Full day of rest for acclimatization to the high altitude of Leh (11,500 ft / 3500 mtrs). After breakfast visit Shey Palace, Thiksey Monastery & Stok Palace Museum. 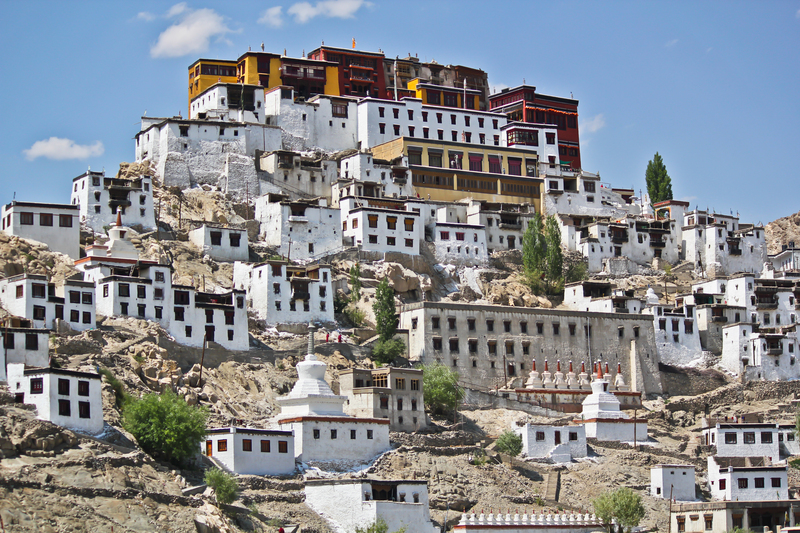 Post lunch at the hotel, visit Shanti Stupa, Sankar Gompa & Leh Palace and then explore the local markets. Overnight stay at Hotel in Leh. After early Breakfast leave for Pangong Lake (14,500 ft), through Changla Pass 17,350 feet. It is the third highest motorable road in the world. 1200 hrs. Arrive Pangong, it is the highest salt water Lake in the World, shared by two countries India & China. Enjoy the beauty of the lake on the Banks of Pangong while appreciating the changing Colors and fascinating high altitude of the Lake. Drive back to Leh by the same route Overnight stay at Hotel in Leh. After breakfast leave for Nubra Valley, driving across Khardongla (alt: 18,380 ft). After descending from the pass, drive on for sightseeing of Sumoor area and Samstaling Gompa. Overnight stay at Hotel / Camp in Nubra Valley. After breakfast visit / explore Deskit, Hundar and the Sand Dunes where you can enjoy a short camel safari using the double-humped Bactrian camel found here (optional on direct payment). Later drive back to Leh reaching in the late afternoon / evening. Overnight stay at Hotel in Leh. After leisurely breakfast, leave for Alchi / Uleytokpo on the first leg of the journey to Kargil and Srinagar. On the way visit Hall of Fame, Gurudwara Pathar Sahib, Magnetic Point, Sangam (confluence of Indus & Zanskar Rivers) and then the 11th century Alchi Choskor, oldest surviving monastic complex famous for its wall frescoes and architecture - a UNESCO listed heritage site. Overnight stay at camp / resort at Uleytokpo. After breakfast leave for Kargil. On the way you can visit the dramatically located Lamayuru monastery and the adjoining “Moon land” hills. Later drive towards Kargil enroute viewing the 9-Mtrs. tall rock sculpture of the Maitreya Buddha at Mulbekh (7th –8th century AD). Overnight stay at Hotel in Kargil. Early departure for Srinagar driving through Drass (famous as the second coldest inhabited place in the world) and crossing the Zojila-la Pass (11,500-ft. / 3,505 m) to reach Sonamarg from where it’s a smooth 2-hour drive to Srinagar through the beautiful Kashmir countryside. Overnight stay at Houseboat in Srinagar. After breakfast you are transferred to the Srinagar airport to board your flight for onwards journey with the sweet memories of Holidays..